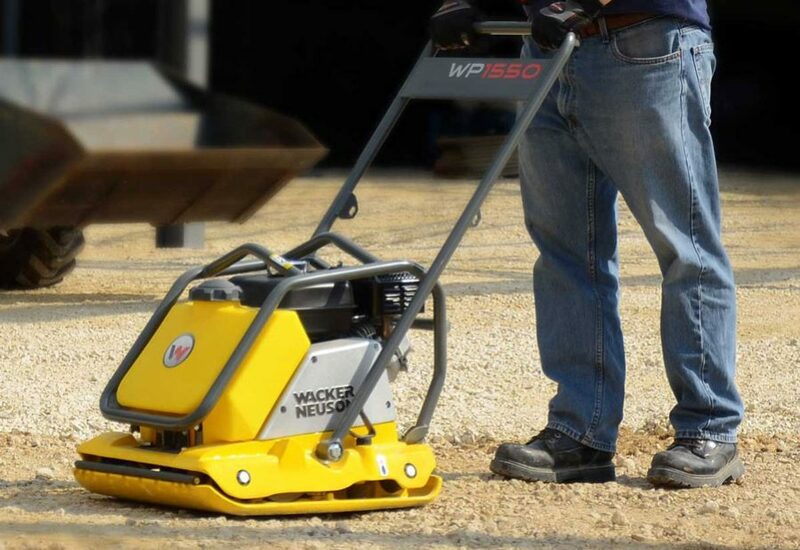 The WP premium plate series feature a computer designed base plate that has a tapered bottom and edges for high speed and excellent maneuverability. Designed for the compaction of granular, mixed materials with some cohesive content. Water tank models are available for asphalt applications. These plates have set the standard for performance and durability in confined areas such as parking lots, highway and bridge construction, next to structures, curbs and abutments. WP plates are also popular for landscape applications for subbase and paver compaction. Lightweight, high-strength components keep machine weight down and allow for easy handling. Straight, center-mounted guide handle offers superior maneuverability and can be lowered within inches of the surface to operate the plate under obstacles and form work. Tough, wear resistant ductile iron base plate offers durability and shock resistance. Water tank models have a large capacity polyethylene tank that includes a large filter inside the tank to prevent clogging during operation and can be easily removed for cleaning and draining. Asphalt models include a spray bar with angled holes to allow for complete water coverage for no asphalt pick up on the plate bottom.